East End Road is a 'tidy' ground, and has some old and some new stands. 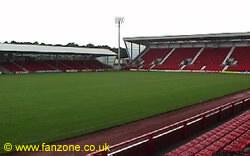 The players facilities are rumoured to be one of the best in the SPL, with the exception of the old firms' but as far as spectators go it is one of the middle of the road grounds. The away fans usually sit in the East Stand behind the goals, although sometimes (Old Firm visits, or when a team brings an unusually large visiting support) the North-East stand will be opened. The view from the stand behind the goal is fine, and there is a decent catering outlet in the concourse (try the Steak Bridies!). The toilets are clean and the PA is audible, which is more than can be said for other SPL grounds. The North East stand is actually the eastern half of the North Stand, which itself is a converted terrace. Luckily, the Pars didn't just bolt on bucket seats to every second row, they put new seating blocks in. This means the angle of seating is reasonable so you shouldn't have to stand. Be warned though, there are plenty of pillars supporting the roof. A small section of the South (Main) Stand might also be available, which offer a high-level view, with only minimal obstructions from pillars. Dunfermline can be reached from the north and south via the M90 motorway. Exit at Junction 3 and head for the town. A right turn at the roundabout at Lauder Technical College, will take you onto Halbeath Road. The ground is easy to find from here - just keep going. You will pass an Asda superstore on your right and a Kwik-Fit garage, a little further on, on the left. After approx 2 miles, you will come to the ground. Follow the signs for Kincardine Bridge. About half a mile after crossing the Kincardine Bridge you will come to a roundabout in the village of Kincardine. Take the sign to Dunfermline on the A985 for 7 miles and finally the A994 (after another roundabout). You will pass through the villages of Cairneyhill and Crossford, Just keep going on this road into Dunfermline. You pass through several sets of traffic lights and a fire station (on the left hand side). Keep going straight ahead until you come to short stretch of dual carriageway. This ends at a large roundabout, by which time you should be able to see the ground. Go straight ahead along Appin Crescent, into Halbeath Road. To get to the ground from the bus station you should cut through James Street, which runs diagonally from the taxi rank at the bus station to the East Port (opposite the Carnegie Hall). You will be able to see the ground from here. There is an official Car/Coach Park at the east end (away end) of the ground. If you are parking on side streets around East End Park, there are the odd cones out to restrict you and the road is not closed to supporters as they leave after the game so you might have to fight your way through pedestrians to get back to the motorway. Alternatively, you may wish to park in the town centre, which has plenty of shops, cafes and pubs. The ground is a short walk away. If you are a registered user then you can login, and create your own personal review of Dunfermline Athletic Football Club - East End Park. These reviews can be private or public.